They don’t understand “edu-speak,” a language full of academic terms that people outside of the field of education don’t speak. There is inconsistency in the degree of information provided; either too little or too much. In my 25 years as a teacher, school principal, and district leader, communication with families has been paramount in developing a culture of ongoing home/school communication, i.e., supporting student success. Current research supports this; stressing the importance of communication in education. But the research extends beyond the communication between school and home, it speaks of the importance of the communication between students and parents/guardians. Student/parent communication sounds like a “no brainer” once we highlight its importance, but schools have not done an adequate job in supporting their students in this journey. Schools stress student independence, but control the conversation between school and home. John Gabrieli, a neuroscientist at MIT, and an associate member of the McGovern Institute for Brain Research, has proven that it’s not just the sheer accumulation of words that builds children’s brains and their verbal and non-verbal skills but rather, “conversational turns,” or back-and-forth banter. His research shows that conversational style proves to be much more predictive of a child’s language development, rather than the number of words spoken to them. Additionally, in a joint Harvard-MIT study lead by researcher Dr. Rachel Romeo, a neuroscientist and speech-language pathologist, it was found that “the sheer amount of language children heard spoken by adults wasn’t linked to children’s brain responses,” it was “the number of conversational turns was more impactful.” So where can these “conversational turns” happen for students and families and how can schools help? The National Commission on Social, Emotional, and Academic Development states that PreK-12 education fails to fully prepare students for the future. They wrote that social and emotional skills and competencies are essential for students success in school, career, and life. This thinking supports the American Journal of Education study done at the University of Minnesota that linked parent and community involvement with student achievement. Anecdotal experience coupled with clinical and professional research points toward the need for schools to increase and support targeted, student/family communication. Yet another study from the American Journal of Education shows that a parent’s interest in their students boosts the child’s mental health, happiness and well-being. Conversations will have a very positive effect on your child’s behavior and achievement. They show your child that you value school and education, in turn encouraging him/her to value it too. However, encouraging parents to simply ask their students, “How was school?” is not enough. It is not easy for a child (or adult for that matter) to reflect on the entirety of their day and sum it up so simply. As a result, it’s easier and more comfortable for a student to respond with, “Good,” or “Okay.” When families talk with their kids about the school day, it shows they’re interested in what’s going on in the students’ lives, but there has to be a more effective and productive way of doing so. Taking the mystery out of what’s going on at school when everyone’s in the loop, at- home conversations about schoolwork are more productive. Giving students agency and having them taking more accountability for their own learning. With clear expectations and a supportive team of in-the-know parents and teachers, kids are more likely to perform and do their best work. So, where can families start? This may be new to everyone involved. Start by making time to talk. Without the time for “conversational turns” questions turn into interrogations, rather than two-way conversations. But students aren’t often compelled to talk, even when time is provided. This is where the fast-paced evolution of technology can be beneficial. Recently, I had the chance to pilot a tech tool that bridges the gap between school and home. A mobile platform that gives students agency cultivates a student’s social and emotional learning, harnesses parent engagement, strengthens executive functions, and causes a powerful two-way conversation. The tool is GAB-on! (click here to learn more). The company’s presentation cited similar research from John Gabrieli and Matthew A. Kraft of Brown University, affirming the benefits of a family conversation in building student self-esteem and improving academic performance. Additionally, these conversations develop student self- awareness, self-regulation, reflective learning, and resilience. Seeing this digital tool in action is impressive. GAB-on! is the first platform that links a child’s school day to a conversation starter at home. It’s not a report from the teacher or school; it’s a conversation between student and family. Students enter GABs about their day, in live time while they have meaning and relevance or during an end-of-school-day reflection period. 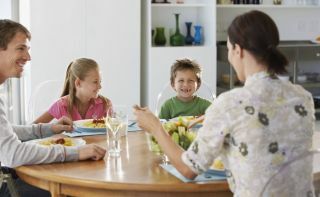 GABs are hints or clues (3-5 words) about a lesson, event, or activity from the school day that act as a prompt for the student to retrace, recall, and remember when they are at home, in the car, or on a walk later in the day – anywhere with a few minutes to share and connect with their family. GABs also prompt families to ask more specific questions about their student’s day to increase conversational productivity and student voice. Consider a Twitter notification or news highlight you receive on your phone. Parents receive GABs from their child (and a few from their child’s teacher) that are only a few words per lesson or event, and these GABs don’t make sense to a parent. These GABs are not a report or full sentences, they are just enough words to act as a prompt to encourage a child to remember that part of their day and start a conversation about it. . There is so much that happens during a child’s day that sometimes they genuinely cannot remember or decide which part to talk about or even how to start the conversation. A GAB serves as a student’s reminder of what happened during the day, leading to more enlightening and surprising conversations. Furthermore, GABs empower students. GAB-on! is a student-led and student-managed platform at school that has students entering the content so parents get to hear their excitement about their day from them. Learning about your child’s school day should not be a burden—it should be enjoyable and enlightening. With practice and consistency, you can make it so. GAB-on! is a tool that can enhance these communications by leveraging current technology and design thinking to bring child and parent eye-to-eye in conversation, consistently. To learn more about this tool (platform) visit their website here, follow them on Twitter @GAB__on, or contact Jarrid and Sylvia Hall, Co-Founders and CEOs of GAB-on! at sylviahall.gab.on@gmail.com.